The title was based on too many puns that combined wordplay and mixing religious metaphors. Be! A powerful word ascribed to events carried out at the order of a supreme being. Behold the man. A baby Jesus image, likely the mother holding the child, who is to be a man many would follow and behold. Others would later attribute super human, even god like, powers to him. 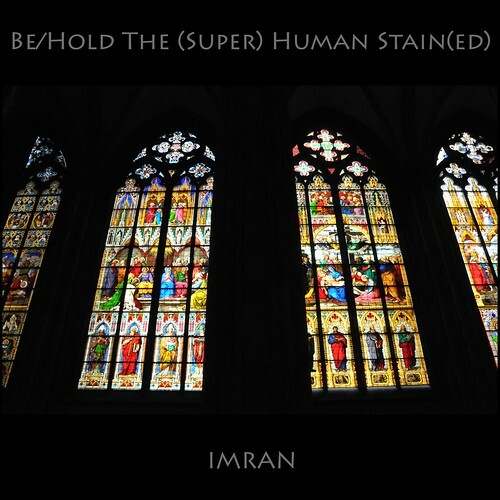 Be/Hold The (Man); The (Super) Human Stain(ed) Glass View – IMRAN™ — SOOC, a photo by ImranAnwar on Flickr. 2012 has gone by in a blur of activity, even as what is likely more than half of my life has rushed by, as time flies, before it is time to meet my maker, at the end of my human life. Because of the hectic schedule, I have not even been able to add more than one or two pictures here since I had the pleasure of passing the One Million Views mark in August 2012. I was about to post a gorgeous sunset I captured at home in New York this weekend, when I remember the Stained Glass theme I played with words on, in the previous photo, of a butterfly, the wings of which almost appeared to be made of stained glass. That reminded me that I had captured some photos deep inside the Köln Dom (Cologne Cathedral) on my arrival there, in Germany, exactly 25 years after my first visit. So, I decided to post a photo from that April-May 2012 trip. This SOOC (Straight Out Of Camera) photo was simply framed in Photoshop and titled, otherwise, nothing was changed. It is how the Nikon D300 captured the windows of these religious symbols, of such symbolism and significance to many Christians. I am a Muslim but went to Catholic schools in Pakistan. That is where I studied Shakespeare and was introduced to puns. And it reminded me of the movie with Anthony Hopkins that related to the games genes and mixed parentages can play, The Human Stain, coming full circle to the stained glass view, of great human beings, miraculous events, stained by violence and murder in the name of God, marred by near-idolatry worship of a great man whose message was to erase idolatry, seen through the windows of time, and stained glass windows…. Do as the man did, not by what others later tell you to do. Don’t be BeHoldEn to dogma created in all religions by power hungry men decades and centuries later to usurp power, to legally steal money from poor believers, and to kill others, in the name of messengers of peace.